Its Photo Heavy. 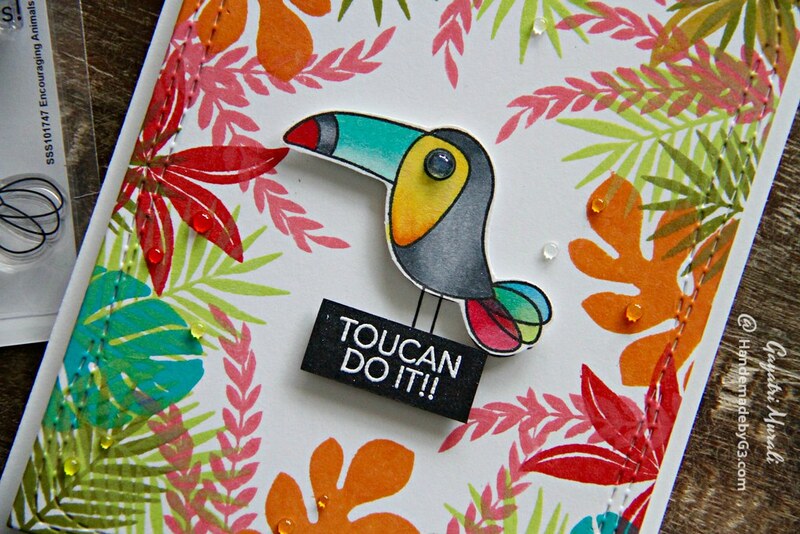 Toucan Do It! I have a couple of cards to share using Encouraging Animals stamp set from Encouraging Words release from Simon Says Stamp. I paired this stamp set with an older stamp set also from Simon Says Stamp called Tropical Leaves. I also used the Tropical Leaves coordinating dies. 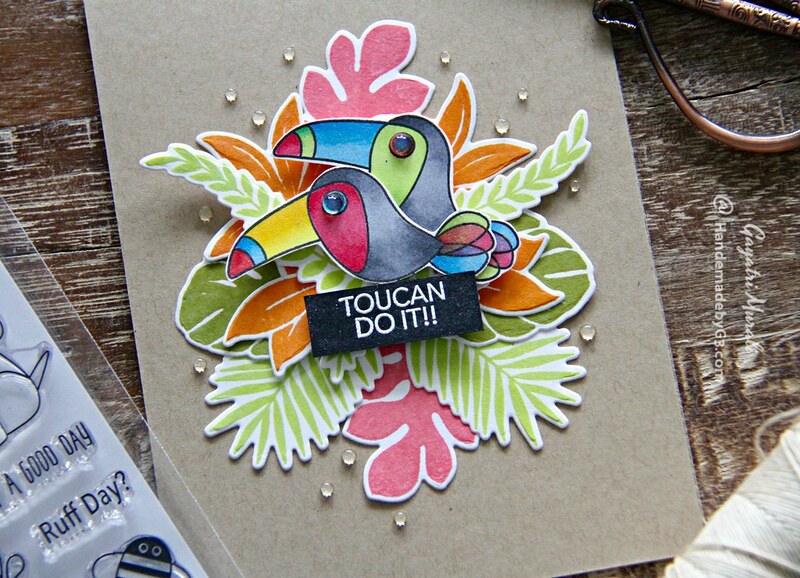 All I used from the Encouraging Animals stamp set is the sentiment and the toucan image. 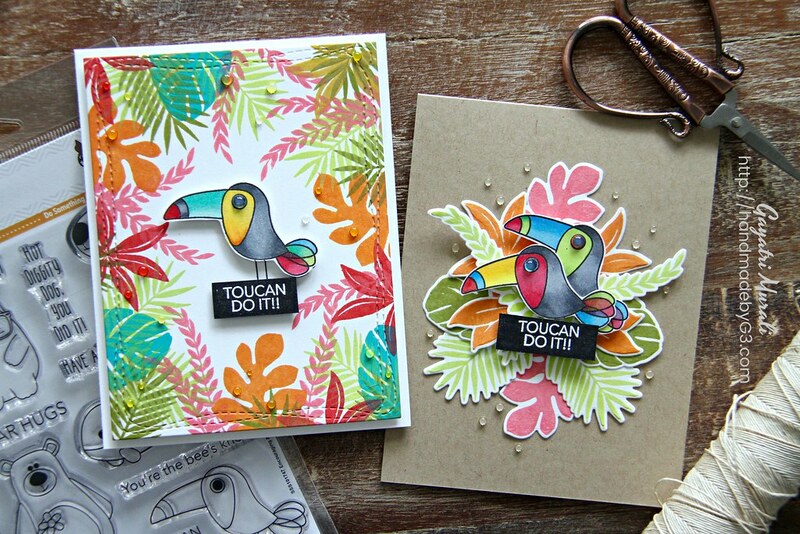 I copic coloured three toucan images and hand cut them out. There are coordinating dies but I don’t have them yet. I white heat embossed the sentiment twice on black cardstock and trimmed. 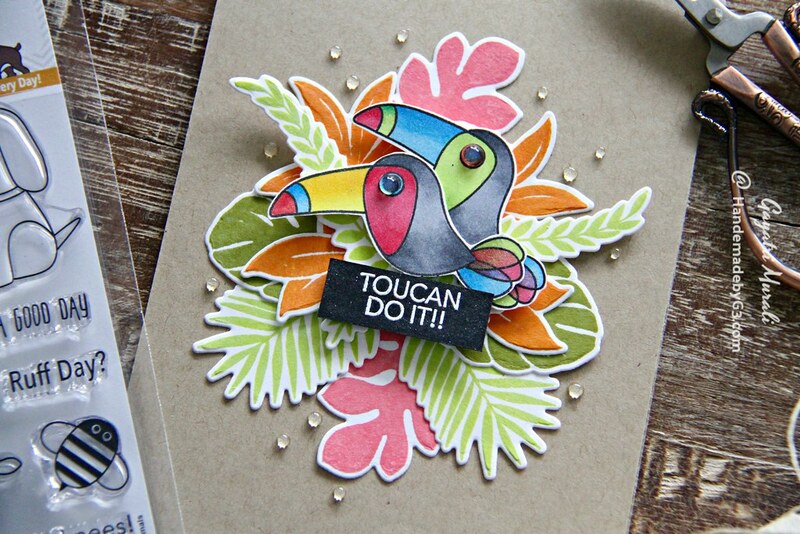 For the first card, I used the Tropical Leaves stamp set on the background to frame the toucan and the sentiment. 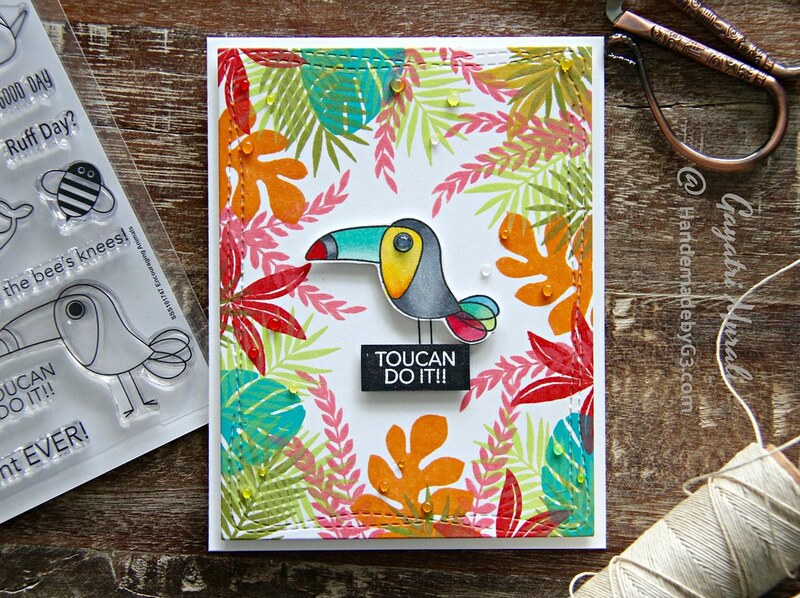 The Tropical leaves stamp set coordinates very well with the toucan. Any guesses as to what inks I used to stamp the tropical leaves images?…………………………………………………………………………………………………………………………………………………………………………..
Its the Distress Oxide Inks! Can you believe the coverage and the vibrancy of the Distress Oxide Inks? I did used mini MISTI and double stamped a few of the images. That was because I did not ink up the stamp well. Otherwise the Distress Oxide inks are great for stamping as well. Not just for blending, adding layers or texture with water! Great product. I stamped the tropical leaves all around the edges leaving the centre of the panel empty. Once dry, I die cut the panel using Simon Says Stamp Wonky Stitched Rectangle die. On the centre of the panel I stamped the toucan image as I did not cut the legs of the coloured toucan image. 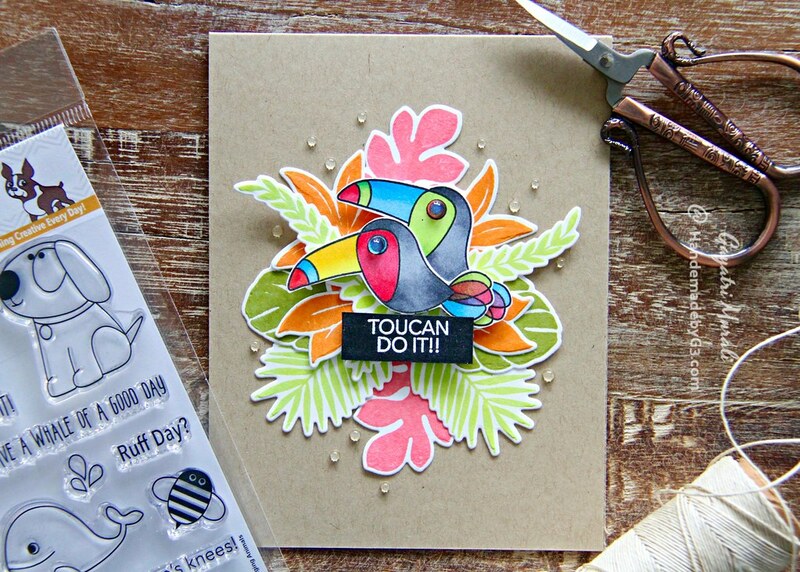 The coloured toucan image is popped up on the stamped image using foam adhesives. I brushed Wink of Stella on the beak, neck and tail of the toucan and added glossy accents to its eyes as well as around the stamped tropical leaves to get the dew drop effect. Here are couple of closeups. 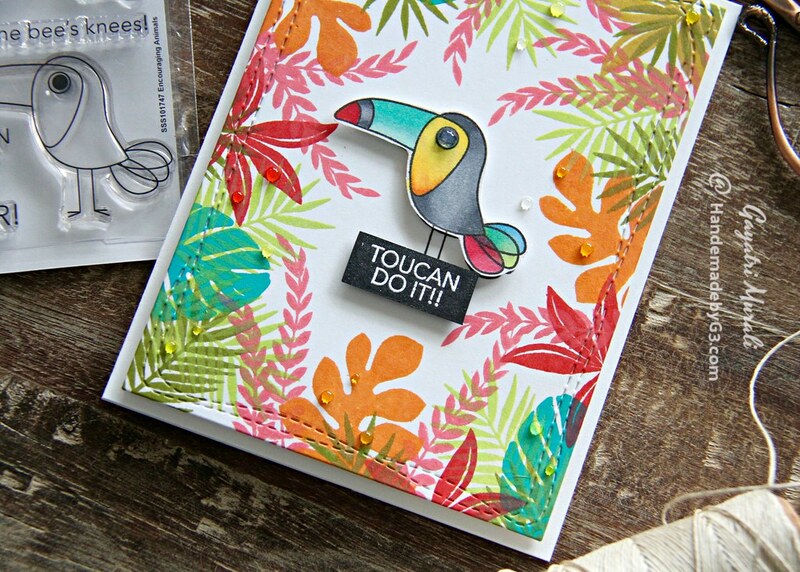 For the second card, I used the same Tropical Leaves stamp set and Toucans to make a focal cluster. Again I used Distress oxide inks to stamp the tropical leaves and die cut them using the coordinating dies. I arranged them in a cluster and glued them on the kraft card front. Then I layered glued the toucans and adhered at the centre using foam adhesives. The sentiment below the toucans. Again I used Wink of Stella shimmer on the toucans and glossy accents on their eyes and around the cluster. Here are couple of closeups. All the supplies used to make these cards are listed below. More stamps and dies from Encouraging Words release from Simon Stamp Stamp is available for purchase from the store. Thanks for stopping by my blog today. Have a wonderful weekend! Love the bright colors for these fun cards! I did finally buy one DO pad, even though I have about a million ink pads–haha! love your cards, they are so cheerful!